Market Report Note: Beginning in 2017, we will post Market Reports for Cornerstone Village on this page, versus a separate blog post. If you are interested in values and what is happening in this community, we suggest you bookmark this page for future reference. 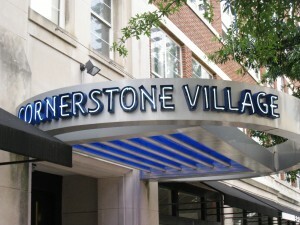 Cornerstone Village was created from two historic building that were converted to condominiums, along with two buildings of new construction in 1999. The community takes up an entire city block. While newer high rise buildings have commanded higher prices, Cornerstone Village has always represented “value” to the Midtown Atlanta condo buyer. This may be due in part to the 4 different buildings, coupled with the amenities being spread out in the community. If you would like to learn more, visit Cornerstone Village Condominiums. And 1 3 bedroom home sold for $354,000. We used to always call Cornerstone Village our “Peachtree Street Value Address.” But with the one bedrooms now pushing over $200,000, it’s still less than most newer highrise buildings, but certainly not as inexpensive as it once was. Data last updated: 4/17/19 12:49 AM PDT. Data last updated: 4/16/19 4:07 PM PDT.